Arts & Crafts Summer Series is HERE! 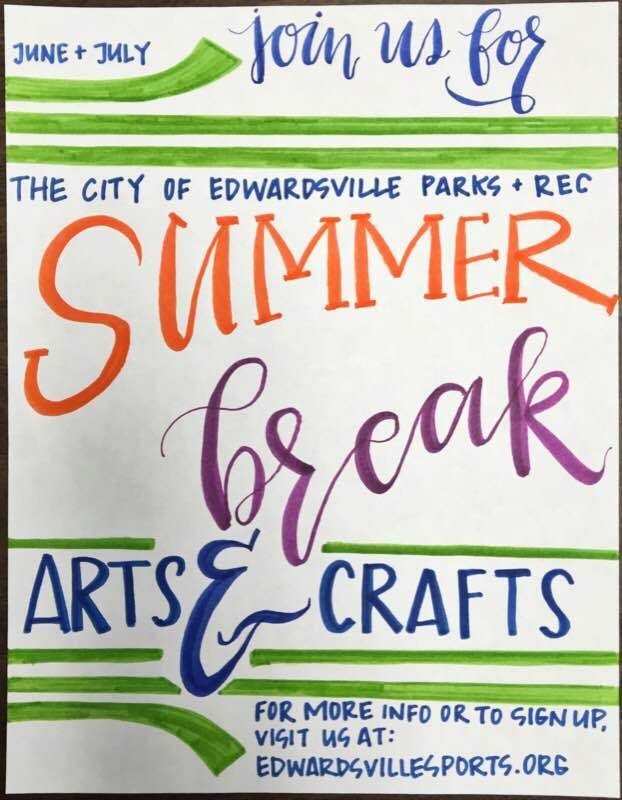 To sign up for summer arts and crafts, go to ARTS/CRAFTS Sign-up! All classes will originate in the Edwardsville Community Center. This week, we will discover how easy it can be to create art using simple lines. Morning classes will create a life size portrait for their final project, while the afternoon classes will create an acrylic painted canvas. Different techniques will highlight the week on the use of watercolors. Students will finish a self-chosen project by the end of the week. Introduction to textures used in art! Morning students will create an awesome sculpture to take home, while the afternoon classes will create a 3-D art project. This class offers weaving basics and will enhance fine motor skills and challenge the imagination! Morning classes will create friendship bracelets, while the afternoon classes will create a petite wall hanging for display! The basics of colors and dividing warm and cool colors. AM classes will create a salt art sea creature portrait, while the PM classes will create an image that follows the works of Pablo Picasso! Looking at the famous FANTASIA movies, we will learn how to pair sounds with music/color. Canvas creations that exhibit your interpretation of music will be the featured project! Ages 4 - 7 and 8 - 11, each class is $8.00. Each class runs 4 days in length, and includes all supplies. Ages 12 - 14 and 15 - 18, each class is $10.00. Each class runs 4 days in length and includes all supplies. Remember, there is a free lunch program at the EDW Community Center that begins at 10:45am and runs until 1:00pm. Register early, as classes are limited to 12 kids per age group.